History: While on an assignment in Europe during World War II, newreel reporter Mack Snelling was captured by the Nazi's, who not only tortured him, but also used him as an experimental test subject. Needless to say, one of the experiments gives him super speed and he makes his escape! 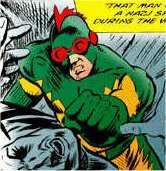 Adopting the ugliest costume ever seen on a superhero (a yellow and green outfit with a red crest and goggles) Mack decides to fight the Nazis with the weapon they gave him, mocking them by adopting a German name. Comments: Thanks to Chris Adams for all the information on this page. He notes "This WW2 version of the Blitz first appeared in Big Bang # 2 (Caliber series). He owes more to the Golden Age hero Johny Quick, than he does to Jay Garrick. It would appear that allowing for the 20 year time difference between the two Earths, that Jimmy (the Blitz of Earth A) and Mack got their powers at the same time, in the same laboratory."